A Sandwell planning officer has won the Young Planner of the Year award in this year’s West Midlands Awards for Planning Excellence. Jenna Langford, a senior Sandwell regeneration officer, won the award for her work on a range of schemes in the borough and her support for young people. The judges said that she had been recognised for her commitment to supporting others and specifically for assisting people to take up planning as a profession through the Planning Futures programme. Under this programme, Jenna has visited schools, colleges and universities to promote career opportunities. She has been a member of the council’s regeneration team since 2010 and has worked on important schemes which have transformed Sandwell, with projects such as the New Square shopping centre, Sandwell College Central Campus and the Providence Place office developments. Jenna has recently been appointed regeneration manager at Sandwell and she said she was looking forward to developing and delivering future regeneration projects, with a particular focus on Inclusive Growth, to ensure that Sandwell communities and businesses really benefited from high quality housing, jobs and connected transportation. 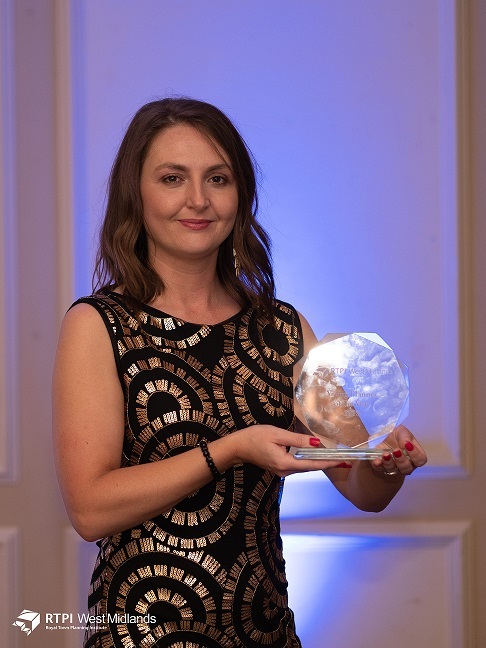 Craig Jordan, chair of the RTPI judging panel, Craig Jordan, said:" Since gaining her chartered status in 2015 Jenna has been motivated to take on new challenges and push herself and her teams to achieve their stated ambitions and more. "It is this recognition that "anything is possible" and with passion and conviction that planning can deliver for local communities that Jenna is a worthy recipient of this year's Young Planner award."